I worked the night before we left, so I got home at 3AM and we left for the airport. I kinda thought it would've been a disaster staying up about 36 hours and traveling, but the flight was straight through from home and I took a good six hour nap. Which is good because, I have this thing about flights lasting more than three hours. I get super ansy and I have to pee constantly. I don't know what it is but once I step on an airplane my bladder kicks into overdrive. Luckily, I woke up right before we passed Mt. Rainer. And it was BEAUTIFUL! It was on the other side of the plane so we couldn't get a picture but it was just as high in the sky as we were and covered with snow! After we landed, there was a good 4-5 hours before we could check into our B&B so we decided to check out The Space Needle, a Seattle landmark! Upon arrival, we saw a pretty cool deal called the City Pass and it was a bunch of tickets and passes around Seattle for $79 a person which I thought was a steal. 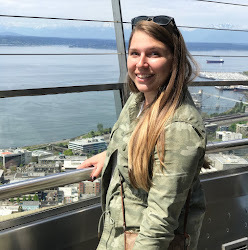 It included two trips up to the top of the Space Needle, once during the day and an additional trip during the night to take in the amazing views! I promise, these pictures don't even do it justice to how tall and magnificent the Space Needle actually is! The wait time wasn't bad at all and we were on top of the Needle within 15 minutes. They have three operating elevators that take 20 people up and down at a time so traffic moves pretty smooth for everyone. After we had our fun high in the sky, we decided to check out the Chihuly Garden and Glass exhibit located right next underneath the Space Needle. This was also included in our City Pass which made me happy! It was an awesome exhibit that sparked some of my 'artsy' interest because all of the pieces in the exhibit are all glass blown pieces! Each piece was blown, one by one, and placed in a specific place! Its absolutely baffling that humans have such talent like this. I mean just look at how magnificent they all are! see all the different glass blown sea animals! My favorite glass sculptures done by Dale Chihuly. The Space Needle through the blown glass! I will forever be thankful for the stranger who capture this PERFECT moment! Besides the treehouse B&B, this exhibit was my favorite part of Seattle. I took so many pictures, I felt it was hard to choose the right pictures to show you guys. Art really has a way of touching my soul. I guess, I love the way something is created and then it can impact so many different people out there in however way its interpreted. The funny thing is art can be understood however you want. Walking around the gardens and even in Seattle there were so many murals, and random statues, it was such interesting city full of life! After spending an initial 2 hours or so in the city we drove out towards our B&B and made a pit stop to check out Snoqualmie Falls. The falls on their own were astounding. Even as we were getting out of the car in the parking lot we could hear the rushing water which just added to my excitement! They had three different view points to see the falls and even provided a few different hiking trails down to the lower end for a closer look. The entrance to the hiking trial 😊 love this! Jimmy found quite the 'hiking' stick. You can't find sticks like that in Florida! During the hike down to the lower end of the falls, we had our first taste of the outdoors that Washington had to offer. And I will be the first to admit it was love at first sight! Jimmy was completely in his element navigating us around each twist and turn and I was ever so happy to keep going to whatever awaited us at the end of the trail! The nature hike provided so many different shades of green AND trees that I had never seen before. In the posts to come, just be mindful of all the greenery! 😋 We walked past a powerhouse that helped generate power with the help of the rushing water and turbines and onto a boardwalk that took us to the base of Snoqualmie Falls. And again, the view was out of this world! There was noise and mist and different smells that I hadn't even experienced before. Mother Nature is truly beautiful people! As much as I had fallen in love with Snoqualmie Falls, it was just about time to start making out way to our B&B at TreeHouse Point. Leading up to our trip, I had gotten mixed feedback about staying in a treehouse but I have absolutely nothing bad to say about this place. This B&B was honestly our driving force for going to Washington because of such perfect timing! Jimmy was about to graduate and I had an upcoming break in my school schedule and while religiously checking the reservation site for TreeHouse Point there was a late opening in a time slot that worked out for us. Our adventure began as soon as we pulled into the driveway and we were greeted by such friendly staff members! A full review and post of our B&B TreeHouse Point and more details on our two day stay there coming soon, I promise! I'll leave you with this teaser picture for now. I started this post probably 20 times and I just can't get the words that I want from my head to the computer. I had this whole plan for Nurse's Week with some postings that fell through and I've kinda been MIA because I was too mad at myself for not preparing ahead of time. Also partly, because we have been so busy. 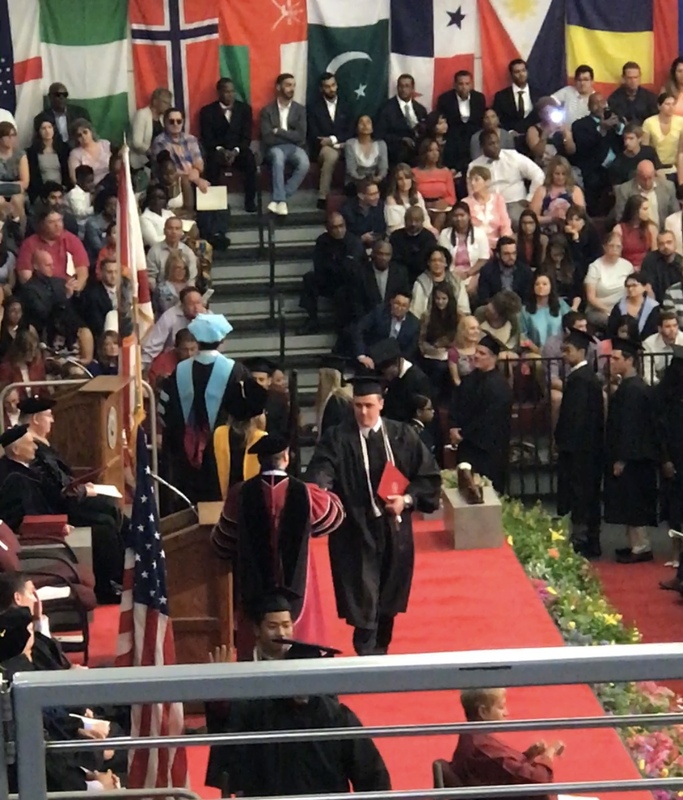 Right when I thought we couldn't get any more things crammed into our life, I had end of semester finals, Jimmy graduated, my in-laws and niece we in town AND we took a cross country vacation! It's so hard for me to look at the calendar and see that yet again another month is upon us! Time is so bittersweet! It was such a moment to watch Jimmy walk across the stage and graduate with his Bachelors degree. I am so proud of everything he has accomplished the last four years, working and going to school full time! It wasn't an easy journey for him but he persevered through! I also thought it was really cool that Jimmy graduated almost seven years to the day that I graduated high school in the EXACT SAME building! It's funny how life works out. Everything truly does happen for a reason! After graduation, we had a family lunch together. Jimmy could only invite four people because it was the largest class FIT had every graduated so not everyone could go. We then had a BBQ at my mom's house the next day for more family and friends to fare Jimmy best wishes, it was a special weekend. 😊💖 Unfortunately, we had to take Jimmy's parents and niece back to the airport Monday night which made us incredibly sad, but we hope to visit them in September which will be here before we know it! We didn't have much time from the weekend, literally like 36 hours, until we were packing up for a week long trip to Washington - which was phenomenal by the way! I promise, many postings to come on our Seattle trip, so many I promise you'll be so sick of it! I hope this month has been just as good to everyone as it has been to our family! Nurses week kicks off today and I'm just going to throw it out there - whoever made this day a national celebration, we as nurses can't thank you enough! Even though yes, it is our job, it feels so good to be showered with love for a whole week! People have such a mixed complex about nurses and its pretty comical to me. No, we aren't rolling in a bed full of money (sometimes it feels like a bed full of poop) and no, we didn't get into the field to marry a doctor. And yes, while we're on the topic, we actually do use my stethoscope. We also cater to the ones who aren't feeling their best, the dying and even the needy. And I'm ever so thankful that I don't do it alone. I am part of this bond that no one else can fully understand unless you're in it, right in the thick of things. Unless you're part of the nurse's club. The club that requires long hours on your feet, putting out fires that aren't necessarily yours, and missing important time with our loved ones so we can be there for others on their worst days. I wouldn't trade this career for any other!